Release Version 1.76 - Fast Order Screen, Customer Accounts & More! Version 1.76 is here with exciting new features! 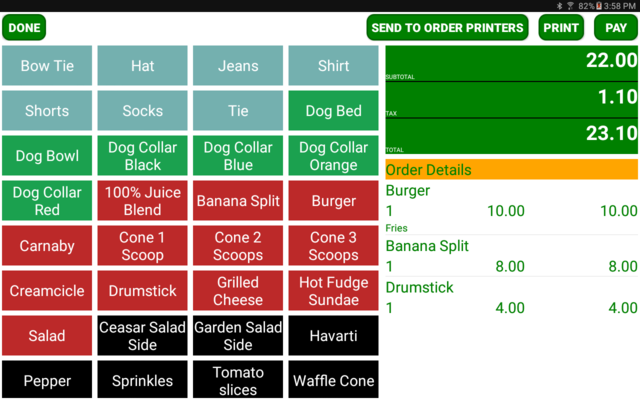 A new fast order screen is perfect for quick service restaurants, ice cream shops, bars, night clubs and any business needing the fastest customer order processing. The screen features colour coded buttons for fast item addition. The order sub-total, tax amount and grand total are displayed and updated as items are added and removed. Buttons quickly send the order, print a receipt or transition directly to the payment screen. The colour coded buttons are easily configured and reference your existing product setup. You may create buttons for all your products or only a subset of them. The fast order screen feature can be enabled for specific tablets in the Basic Setup, Devices section of the secure web portal. The actual buttons are configured in the Advanced Setup, Fast Order Screen section. Another new feature is customer account management. The accounts can be used as both credit and debit type accounts depending on your business needs. The new Customer Account button can be found on the payment screen. The current order can be charged to a customer account either partially or for the full amount. Payments can be applied to the customer account from any tender type such as cash, check and credit. All account transactions print a transaction receipt, including the customer account balance function. The screen showing customer change due has been merged into the closed order print options screen. This streamlines all orders. The Host Sync button has been separated into Download Settings and Batch Host Sync buttons. This change makes it clearer for both new and existing customers that changes to your POS settings can be downloaded at any time and separately from the end-of-day host sync process.